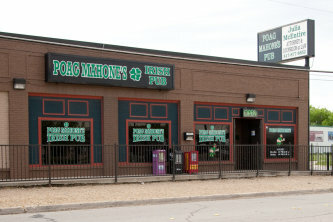 Located in the heart of the bustling West 7th street Corridor of Fort Worth, Poag Mahone's Irish Pub is one of the city's premier night spots any night of the week. We offer a great atmosphere for watching your favorite sporting events. The pub boasts an incredible selection of beer, liquor and wine, fast and friendly service, a spacious patio, pool, darts, Golden Tee and other games. Come enjoy a pint of your favorite beer!